Members of the Inter-Ministerial Technical Committee on Sustainable Management of Deltas in Kenya NO. interests. The challenges facing the Delta require a coordinated approach to planning and management of the resources in the Delta. Only land use planning can provide that opportunity, as sectoral planning tends to be single-resource focused. In July 2011, the Office of the Prime Minister (OPM) established an Inter-Ministerial Technical Committee composed of 18 ministries to coordinate the sustainable management of Deltas in Kenya, starting with the Tana Delta. 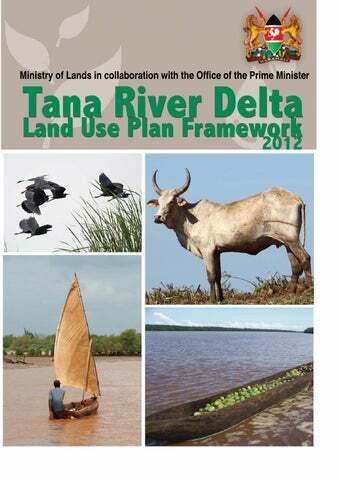 In September 2011, the Government, through the Ministry of Lands and with involvement of other agencies coordinated by the OPM, started preparing a Land Use Plan (LUP) for the Tana River Delta to guide policy formulation and decision-making on future development of the Delta. The LUP will significantly influence the way land is allocated to various users and interest groups. The Tana River Delta Land Use Planning Framework lays the building blocks for the development of a Land Use Plan (LUP) for the Delta. The Tana River Delta LUP will be informed by a Strategic Environmental Assessment (SEA). As far as we know it is the first time in Kenya and in Africa that a Land Use Plan is informed by a SEA in a fully integrated process where the two processes run concurrently. The growing human population and competition for diminishing natural resources, compounded by the effects of climate change, have necessitated a drastic change in the way we do things. Fortunately the Constitution of Kenya, 2010, provides a very enabling policy environment for innovations to tackle the over arching challenges facing our generation. This LUP Framework explores the breadth and depth of the subsequent Land Use Plan for the Tana River Delta. The government of Kenya through 18 ministries and agencies, civil society, researchers and local communities were involved in consultative meetings that informed the contents of this LUP Framework. A LUP Framework provides a vehicle to harmonize competing and sometimes conflicting land uses in the Tana River Delta. The envisaged development of land use plans for the other five major river deltas in the country will immensely benefit from this Framework. Planners, educators, environmentalists, developers, decision-makers and others are encouraged to use this report as a hallmark of true innovation in land use planning for sustainable development. he Tana River Delta Land Use Plan (LUP) Framework/road map was formulated under the aegis of the Inter-ministerial Technical Committee (IMTC) on the Sustainable Management of Deltas in Kenya. The coordination and production of LUP Framework was undertaken by the LUP Secretariat located in the Office of the Prime Minister (OPM). The LUP team consisted of: Peter Odhengo (OPM), Paul Matiku (Nature Kenya), Patrick Waweru (Ministry of Lands), Dan Guda (Ministry of Agriculture), Sammy Kathike (Ministry of Lands), Tom Kinara (Ministry of Livestock Development), Eugene Mmyamwezi (Ministry of Water and Irrigation), SerahMunguti (Nature Kenya), George Koyier (Ministry of Water and Irrigation) and Dickens Odeny (National Museums of Kenya). The LUP team was responsible for compiling this report. The Tana Planning Advisory Committee (TPAC), composed of representatives of key stakeholders at the local level, was instrumental in Peter O. Odhengo Deltas Secretariat Team Leader, providing information for this report as well as in creating awareness among Office of the Prime Minister the communities by organizing and participating in village consultations. Peter Nelson of Planning Green futures (PGF) provided consultancy services throughout the process. To all these we would like to express our deep appreciation. We are also grateful to Nature Kenya for mobilizing funding from DFID, Royal Society for the Protection of Birds, US Fish and Wildlife Service, Ecosystem Alliance (IUCN Netherlands, Wetlands International and Both ENDS) and World Bank to support this activity, providing logistical support, and availing personnel at the local level during community consultations. Sincere thanks go to the Government of Kenya through Ministries, Agencies and non government institutions which provided technical staff to the IMTC: Ministry of Water & Irrigation, Ministry of Agriculture, Ministry of Environment and Mineral Resources, Ministry of Information and Communication, Ministry of Fisheries Development, Ministry of Livestock Development, Ministry of State for Planning, National Development and Vision 2030, Ministry of Lands, Ministry of Forestry and Wildlife, Ministry of Finance, Ministry of State for Provincial Administration and Internal Security, Ministry of Regional Development Authorities, Government Agencies: Kenya Forest Service, National Environment Management Authority, National Museums of Kenya, Tana and Athi Rivers Development Authority, Imarisha Naivasha Board, and Civil Society: Nature Kenya- The East Africa Natural History Society; Royal Society for the Protection of Birds and World Wide Fund for Nature. his report is a road map for the preparation of Tana Delta integrated land use plan. Among the issues contained in the report include inter alia: background, scope (issues and extent) of the plan, stakeholders and mechanisms of engagement and expected outputs and outcomes. Tana delta is one of the largest wetlands in Kenya, rich in biodiversity, home to pastoralists, farmers and fishermen, source of livelihoods to many within and without and lately attracting large scale investments/developments. he Tana River Delta is located in both Lamu and Tana River Counties. The core of the delta covers an area of about 130,000 ha, mainly in Tana River District. It is one of the largest wetlands in Kenya, rich in diversity of flora and fauna and home to pastoralists, farmers and fishermen. It provides ecosystem services to the County and the nation, including shoreline protection and carbon sequestration. The old Tana River district had a population of 96,000 people (Government of Kenya, 2010a); the majority of whom (over 90%) live in the rural areas. The settlement patterns are random but are concentrated close to the river. The main economic activities are farming, livestock keeping and fishing. Agriculture employs about 60% of the population while 40% work in the livestock sector. The estimated population within the 130,000 ha of the delta is 96,664 while the total number of households is 12,457, giving a mean household size of 8 persons. The communities living in the delta are made up of Pokomo - 44%, Orma - 44% and Wardei - 8%, while other ethnic groups, including the Luo, account for the remaining 4% (Government of Kenya, 2009a). The production systems are traditional and are operated mainly for subsistence and outputs are therefore low. Surplus production of meat and mangoes do not reach the markets due to lack of infrastructure. Commercial irrigation farming of rice by TARDA is the only major modern farming in the delta although it is facing challenges. The County is generally food insecure and the population has had to rely on relief supplies. Land is critical to the economic, social, and cultural development of Kenya (Government of Kenya, 2009b). Land is not just a commodity for trading in the market but has other functions; production, cultural heritage, support of the biodiversity pool, climate regulation, hydrological services, living space, connectivity, waste and pollution control, etc. Land is a limited, finite and fragile resource and requires prudent use and management. The Tana Delta Integrated Land Use Plan is a long term plan that will provide increased certainty about how the area can be expected to transform over time. It will also provide a clear indication and direction of the type of development which is suitable in different parts of the delta. Decisions on land development as well as resource use will be based on a sound policy framework. This will boost investor confidence, attract sound investments in the area and lead to increased employment and more income to local communities. Land use planning is a public policy exercise that designates and regulates the use of land in order to improve the communityâ&#x20AC;&#x2122;s economic and social wellbeing whilemaintaining ecological integrity (FAO, 1992).The process entails a systematic assessment of land and water potential, alternatives for land use, and a review of economic and social conditions in order to select and adopt the best land use options. It is multi-disciplinary and multi-sectoral in approach bringing together government, public, land users and civil society as single resource planning is ineffective. Therefore land use planning has an integrative function. However sustainable land use planning requires recognition of limitations of the biosphere and the need for a balance of social, cultural, and economic uses within these limitations (Government of Kenya, 2007). The development of a land use framework is a culmination of efforts by the government, land users, and civil society to comprehensively address the challenges facing the Tana Delta â&#x20AC;&#x201C; competition for the land resources, incompatible land uses, loss of biodiversity, degradation of the environment, rising poverty, climate change, etc. The process will involve extensive and intensive consultations among the stakeholders â&#x20AC;&#x201C; government, decision makers, land users, civil society, big investors, and conservationists. 1.1 Statement of problem Tana River delta is one of the most important wetlands in Africa and the largest freshwater wetland system in Kenya. The Delta is located in Tana River and Lamu Counties and covers a core area of about 130,000 ha. It is rich in biodiversity, supporting diverse species of flora and fauna. 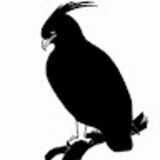 It is internationally important for the survival of no less than 22 species of birds â&#x20AC;&#x153;â&#x20AC;Śmaking the delta one of the key sites in the country for water bird conservationâ&#x20AC;? (Bennun & Njoroge, 1999). Other common wildlife found within the Delta includes hippo, lion, elephant, buffalo, endangered and endemic amphibians and breeding sites for valuable edible fish and shellfish. The Delta is home to diverse human settlements ranging from nucleated to sparse settlements. According to the 2009 census, the population of the Tana delta district was 96,664, made up of the Wardei, Orma, Pokomo, Luo, Luhya, Bajuni and other, minority communities. The communities derive their livelihoods from land and land-based resources through livestock, crop farming and fishing. The Delta also supports commercial irrigation farming of rice and other grains. It is a dry season grazing area for livestock emanating from other Counties. Fuel wood is derived from forests and woodlands located in the delta. Other products include medicinal herbs, honey and eco-tourism, including several lodges and a wildlife conservancy. Currently, the existing human settlement and land use is based on a pattern of over 100 villages within the Delta. These comprise: Pastoralists or livestock herders, namely the Orma, Wardei and Somali migrants; Farming communities, namely the Pokomo and Mijikenda; Fishing communities, including the Malakote, Bajuni, Luo and Luhya; Hunters and gatherers, including the Waata and Boni. More than 300,000 livestock use the flooded grassland for dry season grazing and drought refuge( Government of Kenya, 2009a). There is no equivalent grazing area to which these cattle can be relocated. The delta is also a refuge for wildlife of all kinds, ranging from endangered primates to hippos, crocodiles, elephants, buffaloes, fish, amphibians and huge congregations of birds that make the delta to qualify as an Important Bird Area (IBA) and Key Biodiversity Area (KBA) on a global scale. There is no formally designated conservation area for wildlife and tourism in the delta, although the core area has been proposed for designation as a Ramsar site. Figure 1: The Tana Delta Planning Area. The challenges facing the delta require a coordinated approach to planning and management of the resources in the delta. Only land use planning can provide that opportunity, as sectoral planning tend to be singleresource focused. The time for action is immediate, as continued lack of a land use framework will only make a bad situation worse. Competition for the finite and scarce land resources will intensify and conflicts between crop farmers, pastoralists and wildlife will increase. Environment degradation and poverty (particularly elements based on food and incomes) will increase, resulting from diminishing production and returns from land. Illegal logging and charcoal burning will continue unabated while land degradation through soil erosion and bush clearing will exacerbate the condition. 1.2 Goals and Objectives The development of the Tana Delta Integrated land use plan will be guided by â&#x20AC;&#x2DC;a shared, over-arching, values-based vision for land use in the delta.â&#x20AC;&#x2122; The vision will focus on sustainable development and will be adopted in consultative forum attended by all stakeholders â&#x20AC;&#x201C;government, land users, civil society, other decision makers, etc. 1.2.1 Overall Goal The overall goal of the plan is to facilitate allocation of land to uses that provide the greatest sustainable benefits and provide the transition to a sustainable and integrated management of land resources. 1.2.2 Objectives The objectives include: i. Provide a spatially explicit integrated plan that addresses growth for multiple land uses in a sustainable manner. ii. Identify appropriate land use zoning that addresses strategic issues, environmental protection and development requirements. iii. Propose sustainable development guidelines and identifying action plans for the land use types identified. iv. Propose institutional arrangements to ensure sustainable development and improve land use decisions. 1.3 Justification The Constitution of Kenya provides that every citizen has a right to a clean and healthy environment. Moreover the Constitution provides that land in Kenya shall be held, used and managed in a manner that is efficient, productive, and sustainable and in accordance with the principles of the land policy. It (Government of Kenya, 2010b) also allows the state to regulate the use of any land, or any interest in, or right over land, in the interest of land use planning among other public interests. Transformation of Kenya into a newly industrialized middle income is hinged on social, economic and political pillars (Government of Kenya, 2007). Land is critical to the economic, social and cultural development of Kenya (Government of Kenya, 2009b). Indeed, sustainable management of land is critical to the security and stability of Kenya. To boost food security the government intends to put more land under irrigation agriculture (Government of Kenya, 2007). Rain fed agriculture can no longer be relied on to feed the increasing population. The achievement of Millennium Development Goals (MDGs)especially on poverty and extreme hunger eradication and environmental protection will remain a mirage unless efforts are made to encourage and promote wise use of natural resources. This will depend on management measures put in place. Land use planning is a vital tool for management of land resources. Land is a limited and finite resource, but population growth is rapidly increasing. Conflicts over land resources are inevitable as development pressure for arable land, grazing, forestry, wildlife, tourism, infrastructure and human settlements increases. The land use plan will balance environmental, social and economic interests to ensure prosperity and insure posterity. The development of Lamu port will increase pressure on the Tana Delta. Water for both domestic and industrial use in the port will come from river Tana. Increase in population due to migration will raise demand for food, meaning more land is put under commercial irrigation agriculture to feed the population. The population therefore will increase pressure on limited natural resources in the delta. his chapter deals with how the plan will be delivered. Stakeholder participation and use of science and local indigenous knowledge are key elements. Meaningful participation ensures ownership of land use decisions as well as legitimacy of actions therefore enhancing success of the plan. Sincere negotiations lead to prompt consensus and resolution of conflicts ensuring the plan is prepared and approved within reasonable timelines. Stakeholder participation is also a statutory requirement (Government of Kenya, 2006 and Government of Kenya, 1999). The planning process will be done in three phases: baseline studies, scenario building and development of alternative land use options and finally the preparation of draft and final plan. Data collection and analysis and preparation of baseline report. Scenario building, Development of alternative land use options and evaluation of the options against set criteria –economic, social, and environmental. Selection of a preferred land use option and preparation of an integrated land use plan and implementation strategy. 2.4 Strategies for land use planning Three general strategies will be developed and assessed: 1. Conservation-orientated strategy: This strategy will work with the existing degraded environment and pattern of economic land uses within the Delta to secure major conservation gains. The process will examine where and what form of conservation or protection is required, where development should be avoided and what mitigation is required if development occurs 2. Development strategy: A conceptual model that accepts that all current land allocations – including those that are controversial and heavily disputed by sections of the local community – will eventually be allowed to proceed. This approach will consider what type, amount, form and location of development might be appropriate in the absence of environmental constraints. 3. Community-focused hybrid strategy: This strategy contains elements of both the conservation and development strategies. This alternative will consider the influence of governance, laws, policies, institutional arrangements and capacity, human resource requirements and sustainable concerns to promote public dialogue. As part of the preparatory work, the project team will assess how institutions carry out their mandate; how they relate to each other and how they work for and with the communities. The team will also investigate the ways in which decisions are made and the scope for improving on existing procedures. This approach recognizes that plans will remain unimplemented, without authority, and unfulfilled if there is no effective governance. These initial alternatives will be examined in a consistent manner in order to encourage the development of a consensus view on the ideal plan. 2.5 Scope The Integrated Land Use Plan will be a long term plan, for 20 years. The plan will cover the area of the Delta and will take cognizance of the complex linkages tying the delta to the entire Tana River County and parts of Witu division in Lamu County; an area covering slightly over 2,000 km2. The plan will cover issues such as agricultural land (rain fed and irrigation ), population dynamics, settlement patterns, grazing and pasture, environmental issues (access to water, climate change, biodiversity loss, gene banks, etc. ), governance, land use conflicts, heritage conservation, transportation and transport facilities, fishing and marine resources, land suitability for various land use options, etc. 2.6 Benchmarking In order to inform the planning process in the Tana Delta, the study team has examined other examples of land use planning systems both in Africa and Europe. This should help to ensure that best practice is followed and potential administrative pitfalls are avoided. Local plans usually cover a smaller area. After considering all views and objections, suitable changes may be made and the council will adopt the local plan using it for decision making for the area. The local plans must run in line with the approved structure plans. 2.6.3 Netherlands The Netherlands is a unitary state with three tiers of government: National, Provincial and Local (municipalities). Planning systems are embedded in historical traditions and the distribution of powers and responsibilities between different levels of government.Generally the national government sets the overall policy that is prescriptive and enacts legislation while the lower governments develop the detailed land use plans-regional and municipal structure plans (Marjolein Spans and Hermande Wolf, 2005). The period up to June,2008, the national government made key planning decisions that lower level governments had to adhere to. The provincial governments prepare provincial plans covering broad regions. The local governments(municipalities) prepared structural plans covering their areas of jurisdiction. The municipal plans required approval from provincial government to be implemented. The land use plan is a legal document that is binding and permits for development can only be granted if proposed development conforms to the land use plan. The period after June, 2008, plans prepared by municipalities do not require approval of provincial governments. However the national and provincial governments are entitled to give directions to municipalities and produce land use plans-when they consider themselves responsible for development of the area. The strategic policy documents at different levels were replaced by structure visions that form the basis for the land use plans. The structure visions, related to strategic policies, set forth the basic principles of spatial policies as well as the mode of execution of policies. The national and provincial structural visions are internal guidelines and are not binding on lower levels of governments. In conclusion the Netherlands planning system certainty is provided through legally binding land use plans and development decisions are based on compliance with the plans. It is an integrated environmental planning system with strong ethos of environmental protection and land conservation. 2.7. Planning context Preparation of the Land use plan is guided and informed by the existing Institutional, legal and policy frameworks. 2.7.1. Legal context The Constitution of Kenya is the supreme law of the land. The right to life guaranteed by the Constitution can be interpreted to include the right to a clean and healthy environment. Article 60 of the constitution sets up the principles on which land shall be held, used and managed. Article 66 (1) empowers the state to regulate the use of land in public interest. Moreover, under Article 69 the state has power to ensure sustainable exploitation, utilization and management of natural resources. Land use management is elaborately covered in a number of Acts of parliament such as the Agriculture Act (CAP 318), Physical Planning Act (CAP 286), EMCA of 1999, Water Act of 2002, Wildlife Act, Forests Act, Fisheries Act, Local Government Act, etc. The Environmental Management and Coordination Act of 1999 (EMCA) provides an appropriate legal and institutional framework for the management of the environmental issues and seeks to integrate environmental issues in national economic and social development goals. The Physical Planning (PPA) Act makes provision for preparation, approval and implementation of physical development plans. The Act mandates Local Authorities (LA) to regulate development within their areas of jurisdiction to foster orderly and sustainable development. Other relevant legislations that will be cross referenced in the process of plan preparation include inter alia, the Land Act, Land Commission Act, Land Registration Act, Trust Land Act, Fisheries Act, Livestock Act, Irrigation Act, Tana and Athi Rivers Development Act and the Registration of Titles Act. 2.7.2. Policy framework The Tana Delta integrated Land Use Plan will be prepared in line with existing National Policies and international treaties which are relevant to land use and environmental management. The Kenya Vision 2030 is the development blue print that seeks to transform the country to a middle income and newly industrialized country by the year 2030. The vision is anchored on 3 pillars namely political, economic and social pillars. A number of flagship projects were identified to be rolled out in order to realize the vision 2030. Some of these projects include preparation of the National spatial plan (NSP), development of Lamu port and transport corridor, Resort Cities (Lamu, Isiolo and Turkana), increasing area under irrigation to boost food production and enhance food security and increasing energy production. The National Land Policy (NLP) provides an overall guide towards efficient, sustainable and equitable use of land for prosperity and posterity. It deals with issues of access to land, land tenure, land administration, land use management and land information management. The Water Policy provides for the sustainable management of water resources in the country. It also addresses supply and distribution of water resources throughout the country. It also provides for conservation and protection of water resources and catchment areas. The Forest Policy - (Sessional paper No.1 of 1968) provides for the protection of catchment areas and plantation forests to provide nationâ&#x20AC;&#x2122;s demand of forest products. It was reviewed in 2003 to provide a framework for community participation in forestry management. Other policies that will guide the plan preparation process include inter alia, the National Food Policy, National Regional Development Policy and National Irrigation Policy. Sectoral policies and other relevant sectoral documents will also be cross referenced. These include inter alia,National Water master Plan, Strategy for Revitalization of Agriculture, National forest Master plan, Five year District development Plans and Integrated regional Development Plans. The LUP will also take into account International Conventions and treaties to which Kenya is a signatory and will consider how they will be integrated within the framework of the land use plan. The Millennium Development Goals (MDGs) have an implication on the management of Tana Delta. Two goals are critical to land use planning: Goal 1; which aims at eradication of extreme hunger and poverty and Goal 7; which aims at ensuring environmental sustainability. Kenya ratified the Convention on Biological Diversity (CBD) and prepared National Biodiversity Strategy and Action Plan covering conservation of biodiversity, sustainable utilization and equitable benefit sharing. The Ramsar Convention on wetlands to which Kenya is a signatory calls for wise use of resources within wetlands. In Kenya wetlands include inshore marine waters, coral reefs, estuaries, mangroves and coastal forests. There are four Ramsar sites in Kenya and Tana Delta is proposed as the fifth site. Other international Treaties that will inform the planning process include: Convention on International Trade in Endangered Species of Wild Fauna and Flora (CITES), Rio declaration on the Environment and development (Agenda 21) and the United Nations Framework Convention on Climate Change (UNFCCC). 2.7.3. Institutional framework The preparation of the plan involves partnership, cooperation and collaboration between and among government agencies, NGOs, Civil society, local community, etc. The Physical Planning Department in the Ministry of Lands has the legal mandate to prepare the plan. Therefore the department will provide leadership in order to ensure statutory compliance of the final product. The County Councils of Tana River and Lamu have jurisdiction over the project area. They are important players in the preparation and implementation of the plan. The two councils are critical players in plan preparation and implementation and their support and participation will lead to greater grassroots support and legitimacy of land use decisions. The Inter-Ministerial Technical Committee (IMTC) on the Sustainable Management of Kenya Deltas provides policy and technical guidance.The Office of Prime Minister will provide coordination. A Deltas Secretariat will be in charge of daily running of the project. At the grassroots level, a Tana Planning Advisory Committee (TPAC) will act as a link to the local community to ensure the community is fully consulted and involved in the planning process. The National Environment Management Authority (NEMA) has statutory mandate to protect the environment through regulation of activities. It also has mandate to ensure environmental considerations are incorporated in the nationâ&#x20AC;&#x2122;s overall social and economic development policies, plans, programs and projects. It is within this context the plan formulated will be subjected to Strategic Environmental Assessment (SEA). 3.0 OUTPUTS AND OUTCOMES The planning process will result in the following deliverables: i.
Baseline study leading to situation/baseline report. The Tana River Land Use Plan Framework is a road map for the preparation of Tana Delta integrated Land Use Plan.